Feeling the mid-term blues and just needing to get out of the Bubble? Want to see a new place while also being able to get some work done? 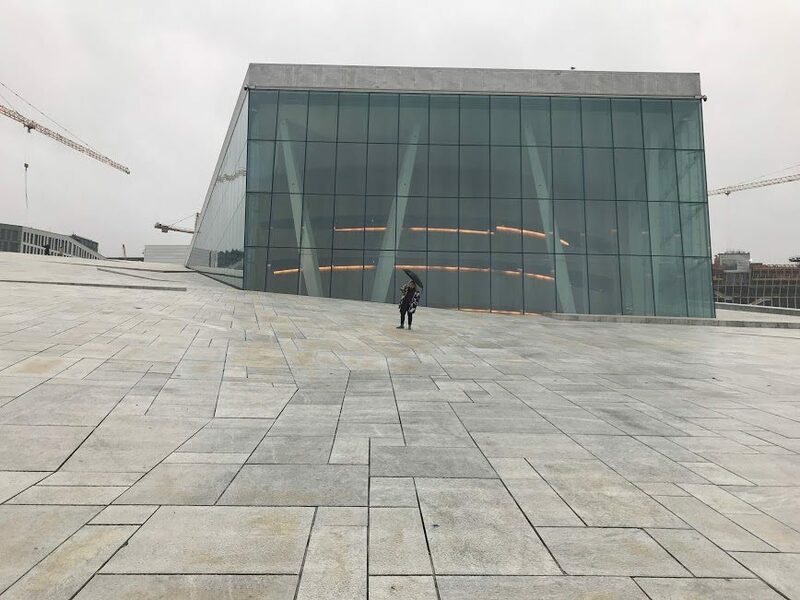 During reading week, I went to Oslo and Bergen in Norway, and strangely I got so much done! Whether you’re going with a few friends or by yourself, it is sure to be a productive and memorable experience. To make sure you see the best of these places and get lots of revision done, have a read of my recommended itinerary. It’s only a two-hour flight from Edinburgh to Oslo, but there are only a few non-stop flights each day. Spend the night walking around the town, and catch dinner somewhere such as Aker Brygge, where there are tons of cool restaurants with a very chilled-out vibe. You could work sitting on a patio and admire a gorgeous view of the harbour – while under a blanket and heated lamp, of course! Protip: Bring an umbrella with you as the weather in Oslo (like in St Andrews) can switch from heavy rain to sunny skies very fast! Everything can be seen in Oslo either by using public transport (Ruter) or a hop-on, hop-off bus. Firstly, I would check out the Opera House (operahuset) - it’s gorgeous on the outside and inside. There’s also an indoor café where you can do some writing. Make sure to walk on the roof of the building (even if it’s raining, it’s not slippery!). Whilst on a bus, it’s worth driving around the Akershus Fortress. There is an Edvard Munch Museum in Oslo, but if you want to see his most famous pieces, I suggest going to the National Museum, instead. It’s beautiful, and has a room dedicated to Munch. It’s also in the city center, so it wouldn’t take much time out of your day to visit it! Lastly, a walk through the Vigeland Park is a great way to end an intensive day of revising/sightseeing! Whether in the rain, snow or sun, I fully recommend a visit. Choosing to take the train to Bergen was one of the best decisions I’ve ever made! Even though the plane journey only takes 50 minutes, the train trip is so worth it! There’s usually about four direct trains per day to Bergen. I suggest taking the train at noon and getting a window seat. You can enjoy breakfast in Oslo before buying lunch and snacks at the station for the ride (there is food served on the train, but it runs out fast!). You can enjoy seven hours of gorgeous views, and you never have to abandon your revision. The views are breathtaking, whether they be of a sunny lake or an uninhabited stretch of snow, there are plenty of different things to see. Once you arrive in Bergen, there is just enough time to settle into your accommodation and have dinner. I suggest starting your first day with a tour of the fjords. The tour which leaves from the main harbour in town lasts three hours and is beautiful. You can bring your work onto the boat with you, admire the tiny seaside towns, step out for a few pictures, and you can still get lots of revision done! Once you’ve finished exploring the iconic dock, Bryggen, there are lots of good restaurants and cafés to visit with good Wi-Fi and ample space (there’s even a Starbucks with a great view!). I would spend the afternoon here as well - it’s so quaint, and has lots of winding streets to walk through. I would definitely recommend looking into the Christmas shop and buying a Norwegian sweater, maybe even a souvenir or some presents! I would suggest leaving the computer behind for your trip up the mountain Fløyen in Bergen. You can either hike up it or take the tram. There are gorgeous views, and I’d recommend taking a few pictures with the Fløyen troll! After your morning tour, spend the rest of the day finding more nice places to work. This small town has so much to offer students who want to study! Fly out from Bergen to Edinburgh - it’s usually a two-hour journey with a stop in Oslo or Paris. By the end of your week travelling, you will have toured a new country (or revisited some of Norway’s gems) and have gotten lots of work done! Handy tip: If you have a spare day or two before exams, why not enjoy a quick break to Disneyland Paris? There are direct flights from Bergen to Paris every day, and it’s a nice way to relax before the madness of exams starts. Also, if you visit over the Christmas period, the decorations everywhere will help motivate you to want to finish your exams and get into the holiday spirit!